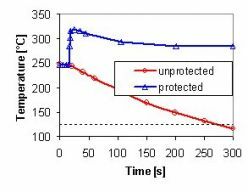 The right Figure shows the LBE temperature at the heat exchanger exit for beam interrupt transients with and without protection, respectively. In the unprotected case, no actions are taken, whereas in the protected case, the control valve CV2 is opened in 5 s after the start of beam interrupt, and at the same time the control valve CV3 is closed. In the unprotected case, the LBE temperature decreases and reaches the freezing point (123°C) in about 4 minutes. 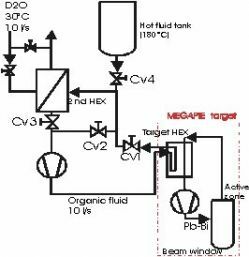 In the protected case, the LBE temperature can be kept far above the freezing point, and blockage of the flow path, subsequently, the damage of the target is avoided.